My work is normally void of any personal meanings or hidden innuendo. I like it to be about what is seen, not what is underlying. I chose to focus on manipulating surface texture and exploiting materiality. I prefer to play with colour, form and scale. However, while making this series of work, I have found myself leaning towards feelings of loss, pain and even regrets. ON PAPER is made from discarded library books, the first book that started this series wasMummies, Tombs and Treasure: Secrets of Ancient Egypt, which I had been keeping for my partner Peter Speight, who died suddenly in September 2012. For me, these works aren’t sad, even though I was feeling that way when I started making them, nor are they therapeutic, as many people may rightly assume. The process of cutting up and sewing back together isn’t new to me, I’ve been making works this way for years. Instead, it’s the use of the discarded library books that is new and has found it’s way into my art practice because of the time I spent with Peter. I’m thankful for that. I work in public libraries, and Peter loved books, so I was always borrowing and buying discard books on subjects that I knew or thought he’d be interested in. When he died, I had yet to give him the Mummies… book. I’m sure, discarded library books would have filtered into my art practice eventually, but it was because of Peter and circumstance that ON PAPER is made from them. The book is experiencing a new life, re-contextualised as strips of material, sewn together by hand. The process may have been been therapeutic as with each stitch a memory. Perhaps the mending expands beyond the physical work. While the results are typical of Wells’ work in their contemplative elegance, feelings of pain and loss are replaced by fond memories and appreciation for time spent together and inspiration still being received after-life. 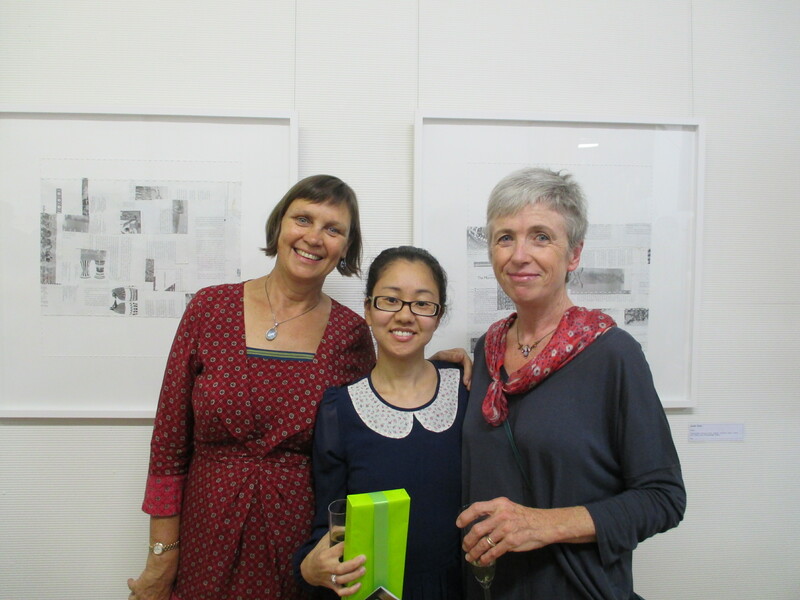 It is a great privilege to be asked by Ahn to open this most personal exhibition of her work. Over the past 12 years since moving to Newcastle I have seen an extensive range of Ahn’s artworks, the first being a series of photographs entitled The Trolley Pushers exhibited at Lovett Gallery in late 2001 and completed during Ahn’s student years. Subsequent exhibitions over the intervening years have demonstrated her individual interest and personal interpretation of drawing, fibre, paper, in 2D and 3D constructions and arrangements utilising crochet, weaving, and her subtle and always hand-wrought manipulation of surfaces and forms through piercings, cutting, stitching, gluing. This exhibition On Paper is as much the crystallization of her always committed and thoughtful practice as any of her previous shows, but On Paper is particularly poignant for its reference and genesis in Ahn’s relationship with the much loved Newcastle artist Peter Speight, who died suddenly in Sept 2012. One of the most compelling traits of Ahn is her honesty – those of you who know her know this: she is refreshingly, disarmingly true in what she says, ponders, thinks and feels, and this element of her always resides within her work, quietly immovable and aesthetically substantial. She chooses her materials – in these works around us here, paper, pages from the book Mummies, Tombs and Treasure: Secrets of Ancient Egypt , wool, oil pastels – because she has plumbed their qualities for her use and because intrinsically she knows how they feel and can work for her. They are ingredients for an outcome that she has not necessarily visualised but one that involves processes in which she has confidence and experience. Her honesty, strength and clarity in the way she approaches her art-making, and her life, is reflected in this – look at the surface – what you see is how it was made,hand stitching, cutting, textures of oil crayon – elements re-configured that in their final form invite the viewer in, to wander in and around and to explore the work individually and personally. These are open works . Ahn concentrates on the surface whilst intrinsically knowing that art is about life, that any artist reflects their life, their experiences, in what they create and make. She chose this particular book because it linked her to Peter and she began to make these works. Something happens within these compositions of cut and rearranged stitched pages. Whether it is horizons, pathways and voids edged by cut and stitched blocks framed by almost disappeared white stitched borders as in works Book 1-5, or oil pastel grounds of sky, water, earth balanced with foregrounds of stitched page off-cuts in works Tomb, Secrets, Rest, or aerial views of calm armies of oversized stitches moving across busy landscapes of rearranged page pieces in Sleep, Past, Afraid, Existed Ahn makes magic. Immense human feeling lies below. The abstract nature of the shapes, tones, colours and textures so created has a tender and human quality and scale. There is within each work a gentle hand/mind investment and engagement that invites the viewer to look and look again. A wordless communication bounces backwards and forwards between eye, mind and artwork as we each keep on looking and thinking. The magic of this process and the outcome of On Paper is here before you in this exhibition; it gives me great pleasure to open this show and congratulate Ahn on her beautiful and meaningful achievement.